You can choose one of the existing workouts or make your own. I chose to make my own with sit-ups, push-ups, squats, jumping jacks, and burpees (as the Jokers). No equipment required - I don't have a pull-up bar at my house, so I had to omit that. There are lots of possibilities: dips and step-ups using a kitchen chair, kettlebell swings, mountain climbers, high knees, lunges, dumbbell presses, etc. Their facebook page also features some different variations. 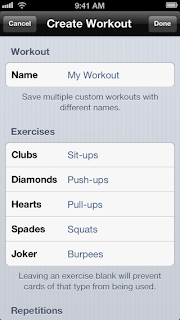 You can adjust the workout to fit your ability level - just alter the exercise, the amount of cards, or omit suits. The app works the same as a literal deck of cards. You just tap the screen and it flips the card for you. It took less time between cards because I didn't have to stop and look at a chart to see what I had to do - it just told me. 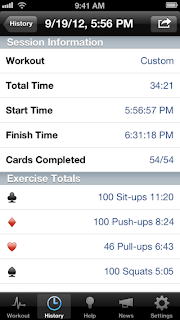 It was great at the end to see how long the workout took me. 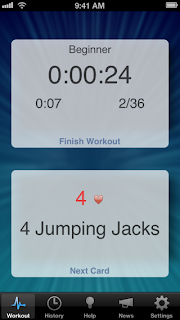 It even kept track of how much time it took to do each set and each exercise overall. My workout took about 25 minutes! I could do this one while I'm waiting on dinner to bake. No excuses! Crank up your music and knock out a workout. Thank you so much for the great review, Allison! So glad you liked the app and shared it on your blog. Let me know your favorite custom RipDeck workout, so we can use it as our Featured Deck In-App and on our social media while also promoting your blog. Thanks again for the wonderful blog post and for supporting RipDeck! Just to make sure you post each week - which I haven't been able to do lately. The more dedicated you are, the more followers you'll get. It's very helpful to participate in Blog Parties, as well. You can check for some on my Blog Party Page.